CES: Gates Offers Take On Digital Decade; Save Us Steve Jobs! At the 2008 International Consumer Electronics Show (CES), Microsoft Chairman Bill Gates used his last keynote to offer his take on the future, talk about the first “digital decade” and what the future offers. 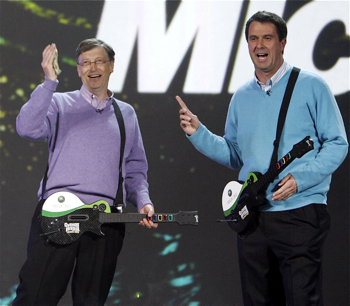 He was joined by Robbie Bach, President of Microsoft’s Entertainment & Devices Division, who helped Gates demo his mad Guitar Hero skills. The second digital decade will be even cooler! They are partnering with NBC Universal for the first ‚Äúlong-tail‚Äù Olympics. Online viewers will have access to more than 3,000 hours of live and on-demand content so they can watch their favorite athlete or sport, regardless of whether the sport has seven fans or 7 million. NBCOlympics.com will be used as a marketing tool to promote Microsoft Silverlight technology. Xbox Live Video is getting ABC and Disney Channel programs and MGM classic movies. Xbox 360 is doing great; never mind the unacceptably high failure rate. 1.5 million users have joined the Zune Social. 100 million copies of Windows Vista have shipped, and they will get cooler between now and 2012. Microsoft Mediaroom is now running on 1 million set-top boxes worldwide. DVR Anywhere will let users watch their recorded programs on multiple TVs in the home. Gates and Bach also discussed Microsoft’s vision for future user interfaces, including Tellme, Microsoft‚Äôs voice-and-visual mobile service that lets you use voice commands. Last year, Steve Jobs completely stole CES’s thunder by announcing the iPhone. Gates has set the stage for this to happen again. Let’s hope Jobs can deliver. Update: We don’t always agree with TechCrunch, but when they say that Gate’s CES Keynote sucked, they’ll get no argument from us. Meanwhile, Gizmodo thinks that Gates looked cooler than Steve Jobs. Or maybe it’s just linkbait talking…..